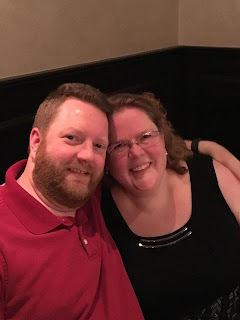 Musings of a Fat Chick: How Has a Month Passed? How Has a Month Passed? Wowzers! It's been more than a month since I've written. The view from our room - pretty spectacular! 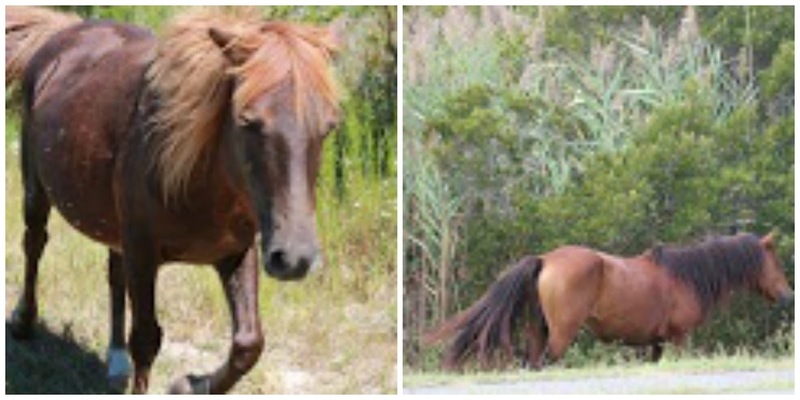 More spectacular ponies on our first trip to Assateague. Our final day at Assateague. I saw both my surgeon and my PCP since I last wrote. While numbers differ from scale to scale, I stick to those on my scale for the sake of consistency. I am down over 100 lbs from my highest weight and 81 lbs from my first appointment with the surgeon. As far as weight lost since surgery? Well, that's at 42 lbs in 17 weeks! 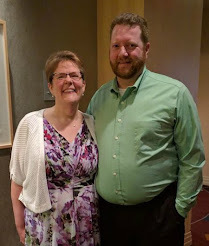 I've had to get a lot of new clothes and it's amazing what a new bra will do ;) While on vacation, I picked up a bunch of shirts from the clearance racks. I've had a problem with jeans for the past several years. While I'm 5'5" (or 5'6" depending on who you ask), even the petites are too long. Well, there is a Christopher & Banks at the outlets. I talked with one of the saleswomen and she pulled a bunch of styles and sizes (I was between sizes and really wanted to get an idea of length), I found ones that are a great length - if I wore shoes with some height. I found a pair to wear for vacation and bought the next 3 sizes down at C&B! Maybe stretching it a bit, but they were $19.99 and I couldn't pass it up! I have had some issues with my back and hips for some times. It's one of the many downfalls of obesity. It was time for hubs and me to get a new bed. Our old one was 18 years old -- an adult HAHA We wound up with a Tempur-Pedic and it was delivered yesterday. The head and foot raise independently and it's pretty cool. Different is hard and different takes some getting used to. The verdict is out, but if our "test ride" at the store is any indication, this is going to be one great bed! We got the split one, so hubby and I can independently determine our own perfect settings. It'll be great once we get it just right! We celebrated my Mom's birthday the end of July and my Uncle's wife took this picture. Not bad, huh? Thanks, Lynn! We had a second photo shoot done. The first picture is from our original shoot; the middle is from a picture taken last September; the final is our most recent shoot, just over 225 pounds (thanks to Jeff Reeder Photography for doing some great shoots!). You have to admit that Poly (on the right) is one curious, yet incredibly silly, pup! I was going to water aerobics at the gym, but it's hard and I have to get up super early to get in a full meal or sleep a bit later and eat less protein and then come home and figure out what to do with the dogs while I shower. I feel so guilty if Poly is in the kennel. I'm not done with water aerobics, just taking a break for now. I have a bike at home (as I've mentioned before) and with the TV, I've been able to do about 45 minutes and around 13 miles. Another thing since surgery: I got a MedicAlert bracelet. Anyone who has had bariatric surgery shouldn't have blind intubations done. That, along with some other conditions seemed important for any emergency medical personnel to know. Well, I have a dear friend who makes beautiful jewelry. 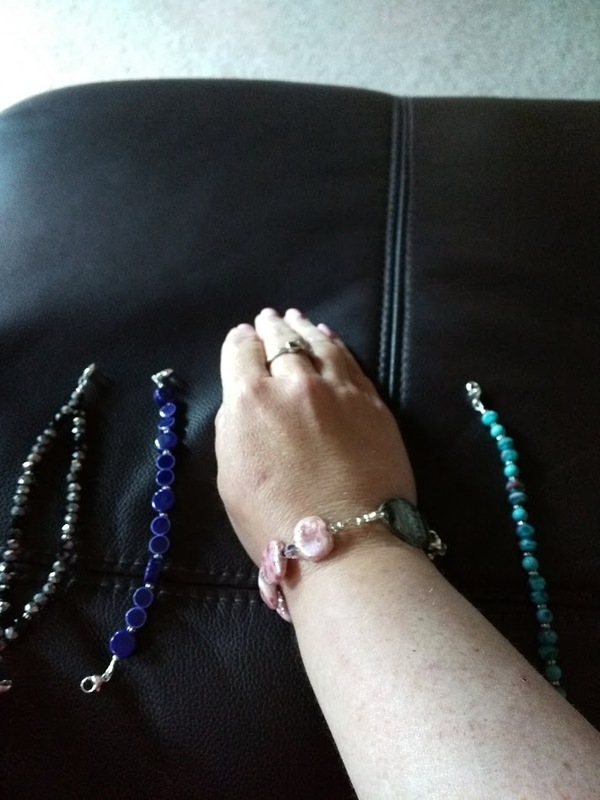 I was going to try to do it myself, since I have done some very elementary bracelet making. I decided to contact Dezetta, of Dezetta's Dezigns, to put it all together. When I ordered the bracelet, I had to make sure that it had clasps at either end so it could be switched out. The least expensive one which fit that qualification had a very ugly, but I knew I would have some beautiful options. See for yourself! It's not the greatest picture, but gives you an idea. The blue goes with just about everything, then there's a teal one and a coral colored one (which I'm wearing). She took the black shiny beads and made something extra fancy for those big dates. I've been able to stand more and walk further. I've done some cooking and hubby has been more open than I expected to trying some of my bariatric recipes. I've taken the dogs for a walk... yesterday was 1.3 miles - I had to get Casey out of the house while the bed was being delivered. He was very happy, but very tired.... as was I! You're doing great and your numbers amaze me! I wish I could do as well, but I'm not as strict about my diet as you are. I'm very proud of you for all the hard work you're doing! Keep up the good work! Thanks my friend, but don't compare! So much easier said than done, right? I admit I do it all the time. You're working hard, too. This whole journey is hard! Thanks for being so consistently supportive!